Plug and play: Plug it in, connect it to your Wi-Fi network and link it to your Ring devices. It's that easy. I have two Ring Doorbells and wanted the ring to be heard in the house not just on my phone, this plugs straight into a socket and works. Pleased that it works with either doorbell that rings. Impressive would be if it had different chimes for the the different doorbells. 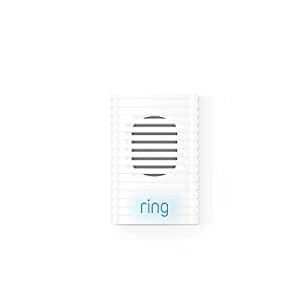 The Ring Chime is constantly loosing wifi connection and is only located 2 meters away from the wifi modem and has no impediments blocking the signal. I would recommend you have your phone nearby and not waste your money. I like the ability to choose all sorts of doorbell sounds and easy to connect on USB. 5.0 out of 5 starsSimple to set up and works great. Works great and very straightforward to setup.